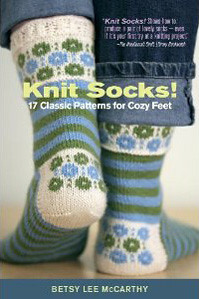 Originally released 6 years ago in hardcover format, Knit Socks! has been completely revised and updated with a fresh new look. I really like the new paperback format, especially the 6" x 9" size, which makes it easy to toss in almost any knitting bag and take on the go. The new expanded edition of Knit Socks! includes 2 new patterns, as well as information on types of yarns available and advice on what feels the best, holds it's shape and most importantly, really lasts. The most useful addition is a chart which provides alternative yarn weights and stitch counts, making each of the patterns easily adaptable to other yarns and sizes. Interchangeable stitch patterns for the sock leg and foot are also included, giving knitters even more control for customizing their socks and creating their own patterns. Ask a sock knitter which needles she prefers and you'll get an immediate response. Whether it's DPNs, two circulars or one long circular, we all have our go-to means of creating and prefer patterns that are easily adaptable to what we like. In Knit Socks!, the author has answered readers' concerns and included advice for adapting the patterns to any type of needle. Knit Socks! includes all of the usual basic instructions for new knitters, or seasoned knitters who need a refresher... the anatomy of a sock, cast on methods, decreases, increases and the kitchener stitch are all covered. The step-by-step pattern instructions are presented in easy to follow color-coded charts and helpful tips and tricks are scattered throughout the book. The patterns span from "plain vanilla" to textured to fair isle to Japanese lace to two-color stranding to lace. With all the variations and possibilities, Knit Socks! will give you options far beyond the 17 patterns. 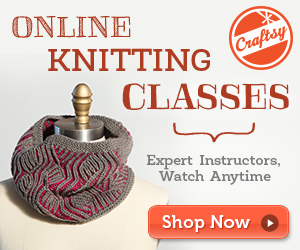 Creative knitters will find an endless array of exciting options for keeping feet comfortable, warm, and beautiful. About the Author: Betsey Lee McCarthy has taught at national, regional and local knitting events over the past 11 years, including Stiches, the Black Sheep Gathering and Sock Summit 2009. She was recently featured in a segment of the AARP series "Your Life Calling" on the Today Show, which showcases people over 50 who have reinvented themselves via huge career changes. Betsey's segment focused on her move from a health care administrator to a knitting teacher and author. She lives in Vancouver, WA where she teaches and supports the local knitting and spinning communities. I think I will have to add that to my wish list! I love the socks on the cover! The original is my go-to sock book, so I'll be ordering this one post-haste.